*The Number Knowledge test assesses a child’s ability to understand and use numbers. Source: CICH graphic using data adapted from The Well-Being of Canada’s Children, Government of Canada Report, 2011. http://www.dpe-agje-ecd-elcc.ca/eng/ecd/well-being/sp_1027_04_12_eng.pdf -accessed July 28, 2017. 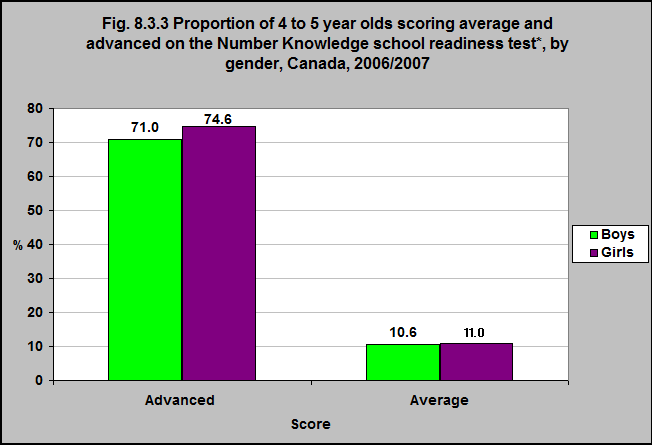 Boys’ and girls’ scores are approximately equal on the Number Knowledge test.